A postcard depicting what was once believed to be an old Franciscan mission with origins dating back to the time of Christopher Columbus (ca. 1451-1506). However, Captain Charles Henry Coe (1856-1954) debunked this myth in Debunking the So-Called Spanish Mission Near New Smyrna Beach, Volusia County, Florida in 1941. Instead, Capt. Coe revealed evidence that the site was actually a sugar mill, which is now known as the New Smyrna Sugar Mill Ruins, which was destroyed by Native Americans in 1845, just five years after it was erected. The ruins were added to the U.S. National Register of Historic Places in 1970. Also known as the Cruger and DePeyster Sugar Mill, the ruins are located at 600 Old Mission Road in New Smyrna Beach, Florida. Original 3 x 5 inch black and white photographic postcard: ACC# SM-00-243, file folder 1 (U.S. blanks), box 10A, Lucile (Mary Lucile) Campbell Collection, UCF Public History Center, Sanford, Florida. Coe, Charles Henry. Debunking the so-Called Spanish Mission Near New Smyrna Beach, Volusia County, Florida. [Daytona Beach]: [Fitzgerald publications], 1941. Redd, Robert. Historic Sites and Landmarks of New Smyrna Beach. [S.l. ]: History Press, 2015. 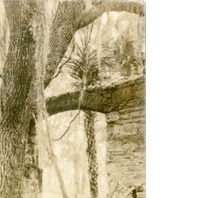 “The Old Spanish Mission Postcard.” RICHES of Central Florida accessed April 23, 2019, https://richesmi.cah.ucf.edu/omeka/items/show/6816.